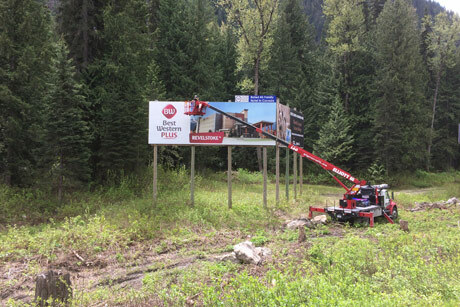 Large Format Printing | Locally owned and family operated sign company producing quality interior and exterior signage for Okanagan businesses. T Scott SignCraft is a Kelowna based, locally owned and operated full service sign and graphic design shop established in 1982 By Jim Scott and Dave Thomas. In the early days of hand painted lettering, Jim and Dave, along with their families, created a strong community oriented business based on exceptional craftsmanship and service. Tell the world who you are with outdoor signage that highlights your presence while promoting your company’s unique identity. At SignCraft, our beautifully crafted outdoor signs are available in a wide range of designs and materials, and all our exterior signs are created with your budget and design aesthetic in mind. Experience the elegance and visual appeal of office signs and interior signage from SignCraft. As specialists in corporate office signs, interior signs, and all types of indoor signage, we work with a wide range of materials and designs to translate your company’s logo into a powerful office sign that truly reflects your image. Vehicle lettering is one of the most effective ways to advertise your business. It’s also very often the first impression people will receive of your company. With professionally designed lettering & graphics your vehicle will help you attract new customers by creating that first impression of a professionally run reputable business. At locally owned and family operated SignCraft in Kelowna, we are ready to dedicate all of our resources to helping you reach your advertising goals. Not only can we provide you with all of your interior and exterior signage needs, we can take you one step further to produce all of your printed marketing materials. The annual cost to keeping your exterior signage maintained isn’t much more and has just the same amount of impact. Maintaining your sign is crucial for maintaining your businesses image. Imagine what you’re telling customers about your business if your sign is only half lit, missing letters or so dirty with grime and residue that it can barely be read from 3 feet away? If you have a large scale marketing project coming up and you’re starting to wonder how you will turn it around in a short amount of time without a huge price tag attached to the job, then you might consider finding a sign shop who can help by putting a flatbed printer to use. Flatbed printers allow sign and print shops like ours here in Kelowna to drastically increase our production capabilities. 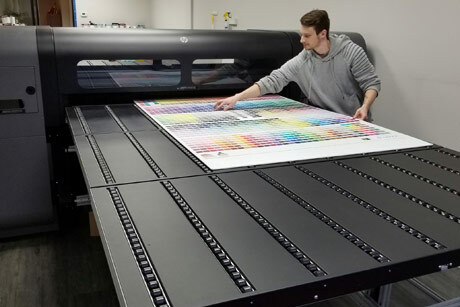 We are one of a few Kelowna print shops to use a flatbed printer and our customers love the turnaround time and flexibility that it provides for both flexible and rigid print applications. Using our award winning HP Scitex FB550 Industrial Printer we are able to produce press quality signage, display and packaging up to 2.5 inches thick all using this amazing digital printing hardware. We can also use the same flatbed printing technology to turn around large scale window graphics to draw your customers into your retail shop and we can even create high end art and design applications commonly used for hotels, restaurants and commercial projects, which can be applied to a variety of surfaces such as wood, aluminum, acrylic, mirror and glass. Flatbed printing is a great way to accomplish large scale projects with short turnaround times. We’ve all been there. A client calls you up with a design project that they need done yesterday and it’s not just a standard flyer, it’s 100 open house, rigid printed, full color, dual sided outdoor real estate signs that need to be ready in two days. You can easily accomplish these type of tight deadlines and complex design requirements with confidence when you utilize Signcraft’s flatbed printing services. We can load in virtually any media and print it in high resolution quality up to 1200×600 dpi, ensuring that your finished product is crisp, clear and catchy. In fact one of the most popular print jobs we use our HP flatbed printer for is rigid printed real estate signage. In a real estate market as hot as Kelowna, we are constantly fielding calls from busy real estate agents and their designers in need of signs. From residential yard signs to colossal highway commercial real estate signage and all the sign toppers and open house wayfinding in between; we have printed it all and nothing makes it easier and faster than our flatbed printer when it comes to real estate signage. Our flatbed printer allows you take ordinary surfaces and transform them into masterpieces that will leave people awe inspired. We can rigid print large, custom art pieces for restaurants and clubs to fill the void on those long expanses of walls and ceilings that beg for something large and fresh to fit the space. The only limitation is your imagination. You can finally bypass the expensive shipping and packaging costs for shipping large scale artwork by using local flatbed printing services and a graphic designer. Create branded pieces, seasonal pieces or something funky that tells the story of your customers space and brand, all for a fraction of original commissioned artwork. Bring your storefront windows alive by overlaying a translucent design over a backlit display for some serious wow factor. We can print multiple images on multiple mediums in one run, which further saves you money because we save on production time, so you can run a single shop window campaign without breaking the bank. We are able to produce true full bleeds from edge to edge to further enhance the quality of your finished collateral. Whether you are looking to run a seasonal promotion with dual sided, flexible hanging signage in every aisle of your shop or you simply want to do something extra at your P.O.S we can accomplish small or large scale runs that are cost effective and durable. Printing custom looking signage isn’t reserved for the big box titans when you consider digital flatbed printing services. Another popular option for clients using our flatbed printing services are stand up displays. Free standing display units are popular for retail and service based businesses who want marketing that stands out – quite literally. They are also used for marketing, events, launches and even in corporate environments and while they are associated with a high price tag you can now save on costly traditional printing by using Signcraft’s digital flatbed printer. It will ensure that your stand up display graphics attract the right business and that you pay the right price. If you are a graphic designer, marketing agency or savvy business owner and you have a window display, POS marketing, outdoor signage, indoor signage, standing display or even custom large scale hotel art you need to call Signcraft to get a quote on our flatbed printing services. You will love the way your job turns out, from the vibrant colors that mimic a press quality job to the quality of the material you present to your clients. 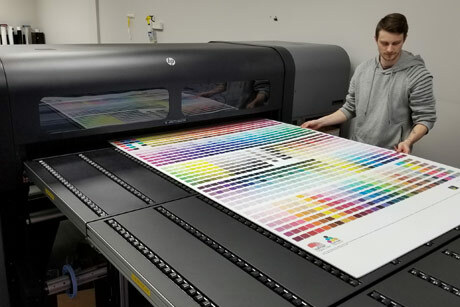 Contact us and let us know if you want to arrange to see some of our Signcraft flatbed printer samples before you start your next large format print job in Kelowna. The Signcraft team have become the exclusive dealer for our exterior and interior signage requirements. Their work ethic and delivery is unparalleled, creating a proactive, conducive working relationship. The quality of craftsmanship and level of professionalism would be an inviting addition to any organization. We have confidence in the productivity and their ability to accommodate our construction schedule and budget. If you're looking to build a strong relationship with a company that can be held accountable, Signcraft is simply your solution. Lee Drescher, CEO, The Bone & Biscuit Co.
SignCraft is a household name, in both our personal as well as our business lives. We have asked for their assistance on multiple projects over the last 10+ years, ranging from just a few dollars to $1000's, and have always been extremely pleased with their service, price, and product. My experience working with Signcraft has been great. I recently re-branded one company and updated another. Every step of the way was easy, from the design consultation process, to meeting our installation requirements. No issue seemed to be too small or big for them to handle. I would recommend them highly to everyone looking at any of the services they offer. We love our new sign and all the extras Signcraft did for us (menu, banner, logo/pop cooler designs).We highly recommend Signcraft, they have fresh thinking and positive attitude also are up for new challenges and ideas. Highly recommended sign shop with great service. We have since used Signcraft for all of our signage needs and have been completely satisfied and very impressed by their cutting edge performance. I have used Signcraft for many projects around my office and have never been disappointed. I highly recommend their services. SignCraft is our go to sign company. Whenever we need a new billboard or exterior signage, Steve at Signcraft is our first choice! Friendly, prompt, efficient service and fair pricing. Signcraft has proven to me over and over that I am dealing with an Honest, Professional, Trustworthy company and would have no problem recommending them to any one in need of the services they provide. 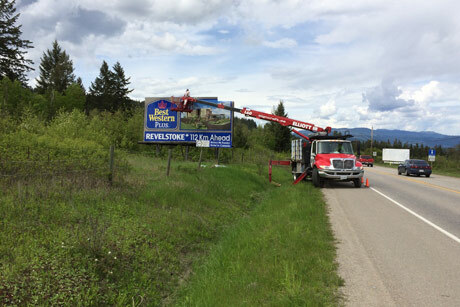 It was a pleasure working with the Signcraft team on our sign project out in Lake Country. They made it very easy to complete and the onsite installers were very pleasant and efficient.